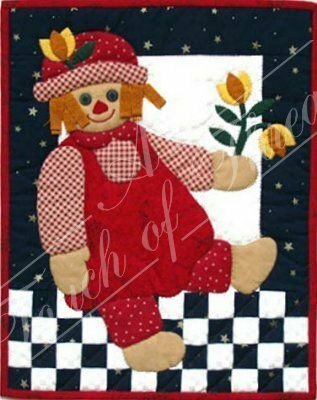 Tousled loops of golden hair, bright button eyes, and a cheery smile make this little rag doll a welcome friend. The doll sits on a checkerboard shelf and rests against the quilt border. She offers a bouquet of freshly picked flowers. The one she keeps for herself is tucked snugly into her hat. Finished size is 13" x 15". Kit includes all 100% cotton fabrics needed to complete the quilt (including quilt top, backing, and binding), plus batting, embroidery floss, buttons, precise patterns, and complete instructions. Colors are navy, red, cream, gold, yellow and green.